We have 2 versions of the Donor Details export - the default and the alternative. Click here to view the description of the alternative report. This report is one of three exports on the Totals by Fund report. It is a list of every donor for a given date range, with one row per contribution. 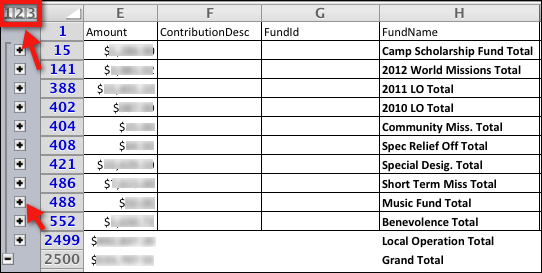 If you are interested only in those who have given to one specific Fund, you can sort or filter by the Fund ID or Fund Name after you open the Excel spreadsheet. From the Totals by Fund report, after you have filtered for the date range and other filters you want, select Export Donor Details . If you use this report for a Word merge, the address can be used as one data item, but will display on 3 lines in the merge. You may want to use the Subtotal feature of Excel. You can sort by the Fund ID and then select Data-Subtotal. 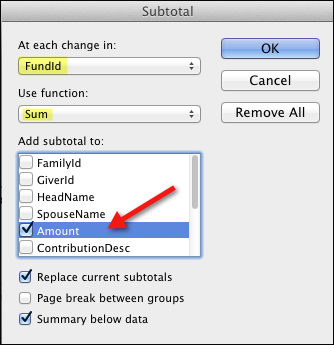 Then you can use the following settings to get subtotals for each Fund. This is a function in Excel and will allow you to look at each Fund with its Totals and a Grand Total at the end. The benefit of using the Export is to have the details, whereas, the Totals by Fund report itself is a summary report. Notice the 1, 2 & 3 on the left of the spreadsheet in the screenshot. Click 1 to get only the Grand Total, 2 to view the sub-totals by group (as you see below), and 3 to view all the details. You can also click the + beside each section to view the details of only that section (see the 2nd screenshot below).